The quantities of waste generated from production and service activities increased by 60% in the period from 2002 to and including 2008. In 2008, Slovenia generated 6.11 million tonnes. In the period 2002-2008, the quantity of recovered waste increased by 60 %, but in 2008 we still deposited 23% of this waste, i.e. 1.19 million tonnes. 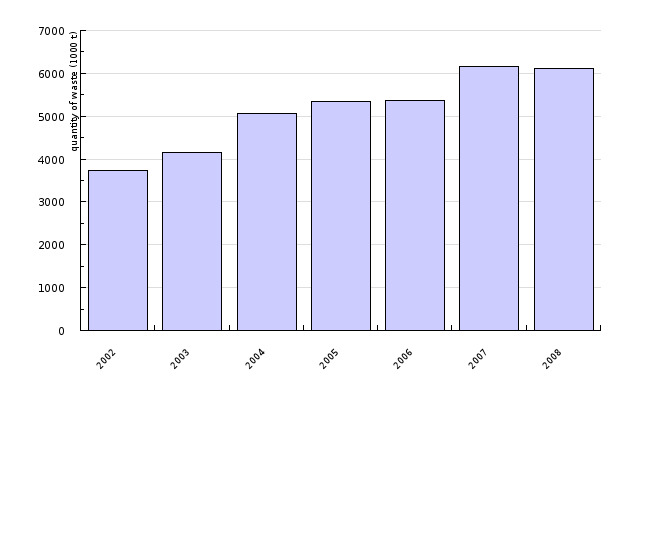 The indicator shows the quantities of waste generated from production and service activities in Slovenia and the relation between the recovered and deposited waste by year. Waste from production and service activities are generated in the performance of various activities and are classified in groups of waste with regard to their source of origin. For example: waste from inorganic chemical processes, waste from photographic industry, etc. Groups of waste are specified in the Annex to the Decree on waste management (Official Gazette of the Republic of Slovenia, No.34/08), where proper treatment of this waste is prescribed, too. Separate collection of waste at source and effective treatment (mechanical, biological, thermal) of the remaining waste after separate collection. The quantity of waste generated from production and service activities is increasing in recent years, from 2002 to 2008 it increased by 60%. In 2008, Slovenia generated 6.11 million tonnes of waste. Compared to 2007, the quantity of industrial waste was reduced by 1% in 2008. In 2007, the most industrial waste was generated in manufacturing sector (31%) and in construction (29%), followed by the sector of electricity, gas and steam supply (26 %). The rest (14%) was generated by other activities. In 2008, 77% (4 million tonnes) of waste from production and service activities was recovered, and 23% (1.2 million tonnes) was deposited. The majority of the waste recovered was recycled (89%) or used as fuel (7 %), while the waste disposed of was mainly deposited (99.6%). In the 2002-2008 period, the quantity of recovered waste increased by 60%, and in 2008, the quantity of waste recycled (3.6 million tonnes) exceeded the 2002 amount by 7 times. 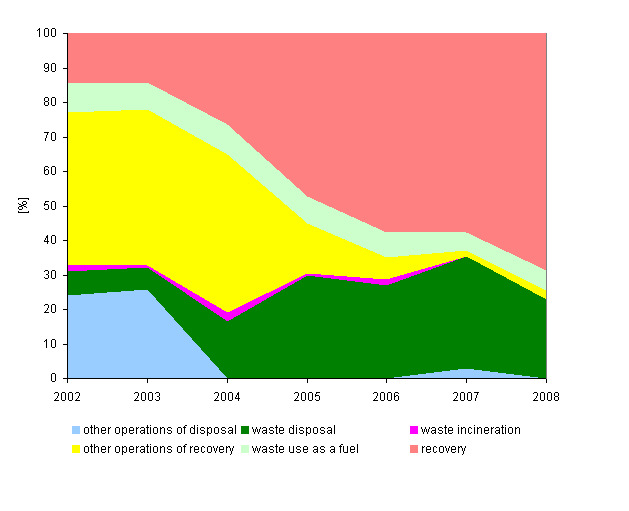 Compared to 2002, the quantities of deposited waste also increased and were by 6 times higher (1.7 million tonnes) in 2007. In 2008, we deposited by 30% less waste than in 2007 (1.2 million tonnes), and we may have started the move from disposal to recovery, which should continue in the future. Objectives summarized by: Operational Programme on waste deposition aiming at the reduction of deposited quantities of biodegradable waste. Source database or source: Waste Management Documents, Environmental Agency of the Republic of Slovenia and Statistical Office of the Republic of Slovenia. Methodology and frequency of data collection for the indicator: Data have been captured for the 2002-2008 period; collected annually. Environmental Agency of the Republic of Slovenia, gathers data on waste generation and management of all types of waste in the Republic of Slovenia. Obligation to report data on waste management is provided on the basis of the Environment Protection Act (Official Gazette of the Republic of Slovenia, Nos. 41/04, 20/06 and 70/08 ), and specified in detail in the Decree on waste management (Official Gazette of the Republic of Slovenia, No. 34/08), and up to 2008, in the Rules on waste management (Official Gazette of the Republic of Slovenia, Nos. 84/98, 45/00, 20/01, 13/03), respectively. According to the Rules on waste management, obligation to report on waste from industrial and service activities comprises reporting obligation on generated waste and its management by generators of waste, collectors, recoverers or disposers of non-hazardous and of hazardous waste from industrial and other activities above the prescribed limit (10 tonnes for non-hazardous waste and 5 kg for hazardous waste). Reports shall be submitted annually, by 31 March for the past calendar year. Data for generated quantities include quantities of hazardous and non-hazardous waste from industrial and service activities, while since 2007 management data are required only for non-hazardous waste from industrial and service activities. The graph in Figure OD17-1 shows data on total quantity of waste generated from production and service activities, taking into account both hazardous and non-hazardous waste. 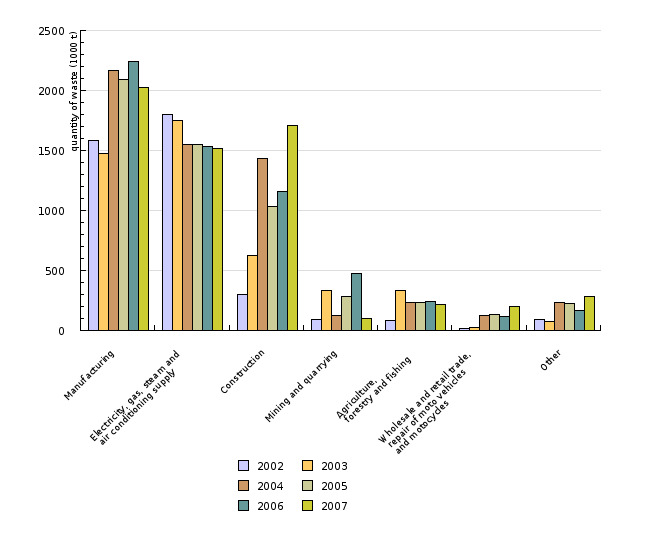 Figure OD17-2 shows generated quantities of non-hazardous industrial waste in Slovenia by sectors (in 000 tonnes). Figure OD17-3 presents management of non-hazardous waste from production and service activities, and shares of their recovery and disposal for the 2002-2008 period.